Welcome to my pencil pet portrait of Henri Bell. This commission was very special for me. I was able to work with a very well known actress here in the UK. Meg and her family sadly lost their gorgeous dog Henri Bell at the age of 18 after having rescued him at aged 1yr. Meg got in touch as she wanted to commission a surprise portrait for her husband. Although she did admit that the portrait was for her too! Meg describes Henri as a ‘bossy little whatsit!’ who loved his family and was a fierce little guard dog who wasn’t keen on window cleaners or cats. Even when he went blind he still knew when there were there!! I truly love hearing about the characters of the dogs I draw and consequently Henri Bell was no exception. Meg commissioned the portrait of Henri as a belated birthday present to her husband. I’m sure it was a wonderful surprise. I spoke to Meg on the phone a few times, and she thanked me personally for creating the portrait for her. Consequently I am always thrilled to speak to my clients on the phone. Very rarely get to meet my clients as I am commissioned from all over the world, however speaking on the telephone is the next best thing! 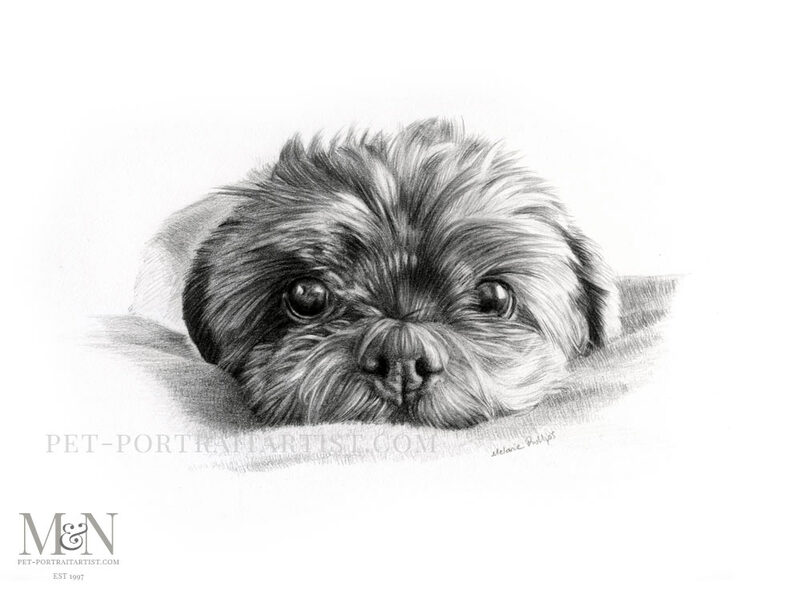 I hope that you all like my pencil pet portrait of Henri Bell too! Finally we hope that you have enjoyed viewing our Art Studio Blog. Why not sign up to our Monthly newsletter accessible at the bottom of our website which comes out on the 1st of each month. You can catch up on all of the portrait stories and news from our Art Studio! Please don’t forget to subscribe to our Youtube Channel too, share, like and follow our social media and you are more than welcome to comment below, we love hearing from our readers!